U.L. Recognized 8 inch long Economical Weight Cable Tie. 8 inch long with a 40 lb minimum tensile strength. Natural color is standard – other colors available including red, blue, green, purple, gray, orange, and yellow. (minimum order quantities may apply). Offers an economical, permanent and secure closure. Tach-It E-8-50 Natural Economical Cable Tie is U.L. Recognized and is 8 inches long. 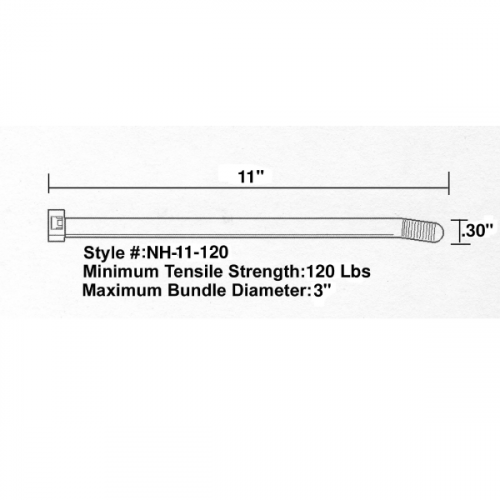 It has a minimum 40 Lb Tensile Strength. Molded of Nylon 6/6.